The small island of Panarea is an ideal place to fully enjoy the attractive coast both for those who like to relax in a real corner of paradise, and especially for all those fond of snorkelling and immersions; of rocky coasts, rich of creeks and suggestive glimpses. The beaches reachable on foot from the inhabited centre are all situated on the eastern and the southern side of the island; the rest of the island is steep and is quite totally inaccessible. The other beaches are situated on the near isles of Basiluzzo and Lisca Bianca, easily reachable from the port thanks to several boats, which will take you to the chosen island at low cost, to take you back some hours later. The beach, situated near the prehistoric village of Punta Milazzese on the south-west from San Pietro pier, is reachable on foot in 30 minutes. Follow the road which leads first to Drautto and then, through an ancient path to Cala Junco, probably used in a prehistoric village like a boat-house. The bay making part of it is shaped as an amphitheatre, surrounded on its sides by extravagant rocky formations which gave birth to a natural pool. This cove is considered not only as the most beautiful bay of the island, but of the whole archipelago; the waters that bathe it assume extraordinary colours varying from emerald green to turquoise , and intense blue. During summer period the cove is quite always crowded, but it is not an obstacle to enjoy the diving into fresh waters, and to lay and relax inside the real corner of paradise. 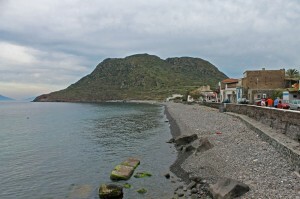 Situated on the southern side of the island the Cala degli Zimmari is reachable in 20 minutes from the port, following the road which first leads to Drautto, and then follows to the prehistoric village. The cove is the unique sandy beach of the Panarea island and is also called the “read beach” for the suggestive colour of the soil which assumes reddish colour. Situated on the north-eastern side of Panarea and reachable in 20 minutes through a road leading from San Pietro to Ditelle, the Calcara beach is one the most suggestive beaches because of its unmistakable volcanic aroma which you breathe in. It ergs upon the collapsed crater and is famous above all for its harmless fumaroles which from the soil soar gas, making it warm, modifying its shades, and creating furrows in the soil.